You must make reservations at least 5 minutes in advance of the time at Sonoma Cellar - Old Town Alexandria. You can pay for street parking or there are multiple public parking lots very close to the restaurant. Even better? You can ride the Old Town Trolley for free from the King Street Metro Station! On most Tuesday and Thursday evenings we have live acoustic music in the wine garden. We have a variety of weekly special events including single winery tasting, wine classes, wine throwdowns and all kinds of wine fun. Including pinot and pups! Sonoma Cellar is a new California-inspired wine tasting room and bistro in the heart of historic Old Town Alexandria, Virginia. Offering an authentic California wine tasting experience, Sonoma Cellar will feature hand-selected wines from 180+ Sonoma County boutique wineries and 20+ Virginia-based wineries where guests have the opportunity to taste a number of varietals from these robust growing regions. Sonoma Cellar’s bistro menu will feature freshly prepared craft foods, designed to pair with the wines, and the gift shop will also carry a variety of distinctive wine-related merchandise. Creamy and decadent, this soup can be served warm or chilled. Enjoy this soup warm or cold. Meatless and packed with flavor. Served with sour cream, cheese and scallions. Mixed greens, dried cranberries, almonds, feta, lardons, sweet red wine vinaigrette. A touch of South America Quinoa; an Asian flair ginger; a wink to India cardamom; makes this salad truly unique, and a favorite of Old Town. The ultimate healthy kick! Chopped kale, beets cubed, diced carrots, and fresh guacamole. It is lightly dressed and the lovely flavors are energizing and cleansing. The tender chicken breast, crunchy pecans and sweet grapes in each bite are hard to top! Prince Edward Island mussels in a white wine broth. Served with toasted bread for dipping. Manchego cheese, chorizo and mambrillo threaded on a bamboo skewer and drizzle with reduced balsamic vinegar. Mini crab cakes encrusted with sesame seeds get a kick from wasabi and soy sauce. The toppings of wasabi mayo, seaweeds and pickled ginger add creaminess, crispness, and tang, as well as color. A homemade marinade adds tang and tenderness to these beefy and tender kabobs. Nicely spiced homemade fig spread is layered on toasted French bread with warm brie cheese and shredded green apples and pepitas. Homemade duck and pistachio terrine, mortadella, Serrano ham. A selection of Sonoma County and California cheeses. The classic American burger with a bistro twist: sliced endive in a Dijon mustard vinaigrette, nutty Gruyere cheese and tomato on a brioche bun. Smoked country ham, bourbon mustard and apple slaw on a fresh slice of Lodi sourdough bread. Grilled portabella mushroom cap, roasted red peppers, fresh mozzarella, arugula and red onion on toasted house-made Focaccia. Marinated white fish with lime juice, garlic, chili powder and cumin topped with a tangy cabbage slaw accented by the mango salsa, which also adds tantalizing heat. Pig and fig in a plate makes a great rustic, unctuous dish infused with garlic, rosemary, shallots and a touch of balsamic vinegar. Shrimp, tomatoes, garlic, parsley and spaghetti-cut zucchini and yellow squash finished with extra-virgin olive oil. Golden crust thigh and leg with aromatic herbs on a bed of Gilroy garlic mashed potatoes. This is the Provencal version of Beef Burgundy minus the bacon and the croutons. We slow cook small chunks of meat with black olive, mushrooms and carrots until they are fork-tender. Italian-inspired dessert. Chef's selection of the day. A decadent brownie for true chocolate lovers! Seasonal fruit served with our house made rosemary syrup. Who says that lavender grows only in Provence? We feature flavors from Morenko's, a local ice cream maker. Specially created, simple, nourishing and fulfilling for a grab-and-go, eat at your desk kind of lunch - Silicon Valley style. Specialty salads and sandwiches and other goodies, sure to please. Made by local producer Fuzzy Paws Barkery. I would stick to Sonoma Cellar just for the inside wine bar. It was a beautiful evening, so we chose to eat in their courtyard. Wonderful that they have space off-street, but it needs to be fixed up a bit for dining. Service was very spotty - there were long gaps without the server in sight, despite a full patio. Food was very disappointing. My husband's steak was sitting on some type of sticky onion jell that he couldn't get off it. My salmon on risotto was overcooked (I requested medium rare) and nothing on the plate had any seasoning. I usually don't salt food, but the veggies (my brussel sprouts, his brocoli had nothing on them, just like my entree). We had to get up to find an employee to give us salt and pepper because nobody was around. I took advantage of the 3 oz pours to try different wines, but because of the missing serving staff, I had wine-less gaps. I hate to leave a review like this, but it was really a disappointing experience. Beautiful venue with excellent service. The staff did a great job recommending wines and keeping our glasses filled. It did get a little crowded and noisy but I guess that's the mark of a good location. We opted to taste a couple of wines and have an appetizer and then ventured elsewhere for dinner just because there are so many options. Why should you have to choose just one! Great menu and great service at Sonoma Cellars along with impressive wine list! Great fun with wine tasting and good food. Excellent selection of wines, good food, and nice ambiance. 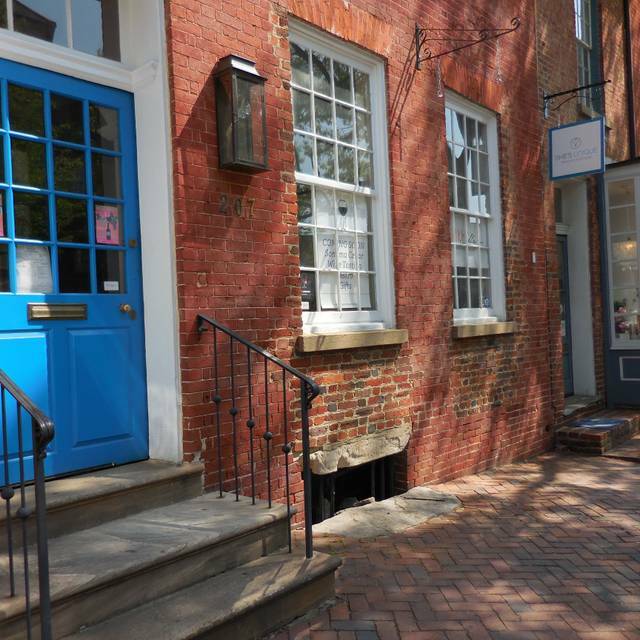 A quaint location, built into an Old Town Alexandria row house with minimal modificaions right on King St. Bistro menu with a good amount of variety. You're able to order wines by the bottle, glass or 3 oz. pour so its great for tasting/experimenting with different colors and varietals. On Valentine's day we were seated and it was more than 20 minutes until a server came over after we had to flag them down. I ordered the salmon and they brought me a chicken quesadilla I never ordered instead. I sent it back for the salmon I originally ordered, cooked medium, and the salmon came out undercooked like sushi and I sent it back and left Sonoma still hungry and went to another restaurant in Old Town. Sonoma is fine if you want wine, but stay away from the food.... The service and food were terrible from my experience. Wait staff was excellent and very knowledgeable. We will definitely be back. Both the fish and the steak were over cooked, but we elected not to return the meals as the restaurant was getting busy and we didn’t want to wait why we estimated would be another 10-15 minutes for new plates. The food was just meh. We were a table of four on a Weekend nite; however, was not crowded. We had different entrees including the shrimp and hangar steak. The bread pudding and wine selection were the highlights. Many better places in OT. Upstairs room was very cozy. Vegetable tacos were delicious. The service was so poor. We barely ever saw our waiter and ended up having to go refresh our water glasses ourselves. The wait staff just simply is not professional. For the price my cranberry and almond salad was incredibly bland. I think they actually forgot the dressing. Delightful experience. Sure to come back. Slow night when we dined - but a quaint little hangout in Alexandria. The food was great, however, the service was slow. We ended up waiting about 30 minutes just for the appetizer, which ended up coming out only a couple minutes before our main course. Food was excellent. Service was spotty at best. Wine not as impressive selection as expected. I like the concept of this place. The wine was very good and the food was great for appetizers. Our service wasn't all the great at all. We were sat upstairs and there were three groups including us and it seems the waitress that was taking care of all three tables wasn't very attentive to either table, but the bartender downstairs did great while we were waiting to be seated. I must have forgotten why I don't usually patronize Restaurant Week promotions. These are opportunities for restaurants to showcase themselves to expand their customer base and so many of them, like Sonoma Cellar, miss the mark. Last night my wife and I went there because we live here in Old Town, had never been and thought the menu offerings looked good. We were very disappointed. I thought the restaurant scaled their portion size to fit the price charged. Starters salads were quite small, desserts were two bites at best and my Beef Bourguignon had two cubes of meat in it but many, many potatoes. If I had ordered these same things off the regular menu, I would have been irate to get these servings at those prices. I think we received a $20-25 value for the $35 charged. I joined friends there for brunch this past Saturday. Charming, quaint atmosphere, excellent service and unique brunch options ( huevos rancheros, tater tot waffle, etc). Would recommend to others! We went to Sonoma Cellar for the first time during the recent Alexandria restaurant week. We were very pleased; as my wife said, we'd be happy to go back. The food was generally very good. We both loved the main courses (the pork chop for my wife, the beef bourgignon for me); the appetizer salads were also very pleasing (though for a 'quinoa salad', I thought my salad actually had very little quinoa). The chocolate cake for dessert was ok, just very dry. The wine list is excellent with some selections you don't often see in the DC area (e.g., wines from Davis Bynum or Teldeschi). On the other hand, the fact the waiter had to warn us that the list wasn't necessarily up to date and might actually not have what we wanted gave us pause, and in fact what we asked for was NOT available. (That sort of thing personally just drives me up the wall, when a restaurant doesn't update its wine list.) But the option the waiter provided was very acceptable. As far as service goes, it was solid. Very friendly, though occasionally a bit slow. We recommend Sonoma Cellar. The restaurant week Sunday brunch was a great value, and the food was excellent. The restaurant was filled at 11 AM, and the staff, while very courteous, was disorganized. Restaurant week brunch party of 3, made a reservation but there was plenty of space. Overall, it was ok - food was actually quite good. Unfortunately service was not great. Servers were not maliciously bad, but there was much disorganization. Servers couldn’t explain what was included on the restaurant week menu. Took excessively long to get a cup of coffee (no check for refills either), ran out of water, servers couldn’t figure out which meal went to which table. Very basic things, simple fixes, just overall diminished the quality of the meal. Hope they improve in this area to do justice to the food. I imagined a cellar type ambiance. I had given a CC to hold the reservation so once I arrived I had to stay despite wanting to leave. The lighting felt like I was in a cafeteria. The bartender was great, food was fine; I just hated the vibe. Great food! Met the owner, very nice guy! Will visit again! The appetizers were delicious and the wine very very good. Nice atmosphere, good food & wine and just-right service! A cheese tray was offered, after the mains. Nice touch. This was followed by a dessert station. Gingerbread, lemon shortbread and a dark Chocolate/peppermint crisp. A bit dry. We would loved to have had something a bit more comforting to the palate. Wine cake, amaretto mousse, warm brownie with wine infused ice cream. The mulled wine offered at the end, was the highlight by far. It tasted of cinnamon, anise and many other divine spices that just said “Christmas”. Truly delicious. We will be back to try their daily menu. The restaurant itself, is charming. We were just hoping for something a bit more special for the $200 we spent on dinner and a bottle of merlot. Will definitely go back. Wonderful food and a great value. This place always delivers! Great food and amazing wine selections you can’t get anywhere else! The experience did not match my expectations from the website. The food was good, atmosphere was a bit bright. I would dine here again if ever in the area. Loved loved loved their hanger steak entree. Switch the potatoes for their mushroom risotto; delicious!!!! Can’t wait to go back and order their cheese platter, that too was amazing!!!! Not bad. Good value: our brunch for four was only $125.00 with tip. Food was OK: my huevos rancheros had ingredients that were fine, each by itself, but it just didn't blend into a single dish. The wine? Phenomenal. The food/service? Horrendous. The waitress hardly acknowledged us and could not have seen less interested in serving us. Two of our meals came out so dry and over cooked; to which the waitress never apologized and later claimed the chef said "halibut is a dry fish" (not true, btw). We haven’t sent food back in over 10 years. Nothing we had was good, it was okay. Just a bunch of frozen subpar quality food products. If they want to fool people into paying $28 for dry/overcooked/frozen halibut, this is probably not the market or location. Suffice to say we will never be back to Sonoma Cellars. We had a wonderful experience. We were a group of 7 seated upstairs in a separate room. It was a special celebration gathering and both the food and service were outstanding. The restaurant is a new find and my three visits to date have been largely positive. However, I have been surprised at the negative reaction from one staff member to a report that the phone number on the web site is not functional. I initially reported, several weeks ago, that no one was answering the phone and more recently, that the number was disconnected. I was met with disbelief. Why a staff member would choose to argue with a client about something that could easily be verified is beyond me. Perhaps he already has a reputation as a bossy bartender in-house? He’s expanding that reputation to customers too.